The subject of Jason Benjamin’s painting Fight Club is artist McLean Edwards – a renowned, idiosyncratic, figurative painter who has been a regular Archibald finalist over the last decade with portraits of actor Cate Blanchett and artist Tim Storrier among others. ‘My portrait of McLean had a long, often painful, sometimes painfully funny journey,’ says Benjamin. ‘We first met in the late 1990s but had no other contact until last year at a Gatsby-like party presided over by Tim Storrier. But something had unlocked in my imagination, not an idea rather a spark. When we ran into one another again at the end of last year I knew I wanted to paint him. Born in Melbourne in 1971, Benjamin became the youngest Australian artist to sell a single work for $50,000 in 2003. Named by Australian Art Collector magazine as one of Australia’s 50 most collectable artists, he is known for his emotionally charged, visually lush landscapes, still lifes and portraits. 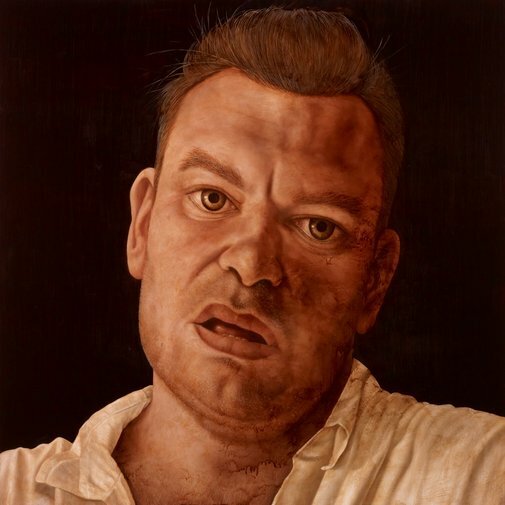 This is his fourth time as a finalist in the Archibald Prize.